Karen Meagher has served as the undergraduate academic adviser for the Specialization in Bioethics, Humanities and Society since Fall 2008. She is a doctoral candidate in MSU’s Department of Philosophy, and will be defending her dissertation, A Virtue Approach to Public Heath Ethics, in early September. Shortly thereafter, Karen will be joining the staff of the Presidential Commission for the Study of Bioethical Issues as a Philosopher Research Analyst. Her responsibilities will include research, writing, meeting preparation, and other projects in order to identify and promote policies and practices that ensure scientific research, health care delivery, and technological innovation are conducted in a socially and ethically responsible manner. 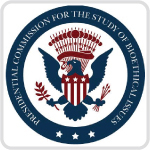 The Presidential Commission for the Study of Bioethical Issues advises the President on bioethical issues that may emerge from advances in biomedicine and related areas of science and technology. Current topics under consideration by the Commission include use and governance of human genome sequence data, the ethics of the development of medical countermeasures in children, and neuroscience and the self. This entry was posted in Alumni, Center News and tagged bioethics, Karen Meagher, philosophy, Presidential Commission for the Study of Bioethical Issues. Bookmark the permalink.